2nd Annual D105 GRAND JAM! Follow us on Facebook for upcoming event announcements! Come on out to Gurrie Middle School on September 14th... food by Q-BBQ, raffle, DJ, family movie, magician, balloons and more. Fun for the whole family! 2018 Kane County Cougars Family Day at the Ballpark! Please contact Laura Finnegan at 708/482.2700 with any questions! to buy raffle and event tickets! Come on out to Gurrie Middle School on September 15th... food by Q-BBQ, raffle, DJ, family movie, magician, balloons and more. Fun for the whole family! D105 Foundation in the PET PARADE! Look for us on SATURDAY, JUNE 3rd in the 71st Annual La Grange Pet Parade! We are thrilled to be partnering with Illinois Harley-Davidson of Countryside to celebrate our D105 Foundation scholarship winners AND to announce a very special upcoming event! Kane County Cougars Family Day at the Ballpark! 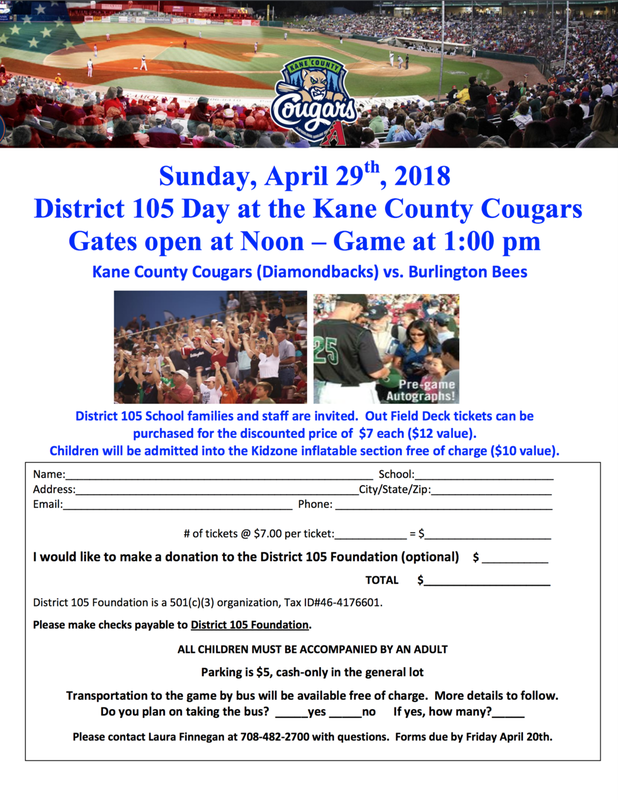 Registration for the 2017 D105 Family Day at the Kane County Cougars Game is now OPEN! Forms are due to your school office no later than APRIL 21ST. Please contact Laura Finnegan at 708/482.2700 with any questions.